Wings of War: Recon Patrol includes the popular D maneuver deck, as well as the new K deck, for two-seater aircraft. It includes a variety of airplanes, from the Sopwith Triplane of Naval 1, planes from Richthofen's "Flying Circus," and even a Turkish Breguet Br.14 B2. 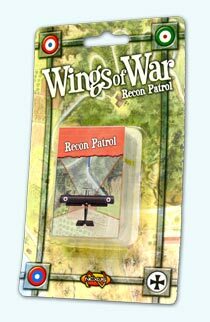 Recon Patrol is a suitable addition to any of the three Wings of War base games.